It sounds so simple. You wake up one day and decide to stop dyeing your hair. But we all know that it’s not that simple. The truth? The transition is not just about hair, but so much more. Personally, from the moment I decided I was DONE dyeing my hair, I felt incredibly FREE! Free from wasting my time and money on hiding my silver roots.. and also free from caring what society thought about my hair. That feeling of liberation hasn’t diminished, even though I am one year into the transition! 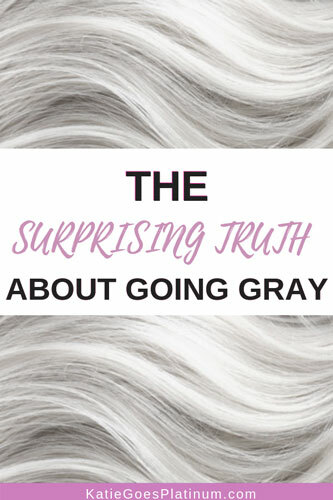 I surveyed my fellow silver sisters this past week on Instagram and Facebook; I asked them what surprised them the most about transitioning to gray hair, and what were the most unexpected side effects of the transition. Never having to worry about roots showing again. I was amazed at how often that thought crossed my mind until I realized I was all one color now. The sense of freedom/relief from the expense, time, making appointments, and the chemicals that coloring my hair required. Like many women, the sense of freedom and empowerment. Being my authentic self. And I just love the uniqueness of everyone’s hair including my own. I just can’t wait to be fully transitioned. I just wish I could click my fingers and see my true self.. The freedom of not having to worry about dyeing my hair and planning around events and making sure my hair has fresh new dye. This isn’t just a color hair thing. It’s so much more than that. It’s about courage, attitude and self love. I’m surprised by how much I have not and do not give a flip about what others think. I am surprised I am not as vain about the grow out phase!! I used to freak out if I had to go out and my white roots were peeking out. Honestly today, I don’t even notice them anymore. I love them!! Oh that liberating feeling! It’s like saying F** You in so many ways! I can say I really don’t give a poop about what other people think of me! That’s very freeing. Positive benefits include: saved $$$ and time, and a newfound sense of authenticity! The emotional rollercoaster has surprised me. I’m usually someone who makes a decision and sticks with it, but I’ve vacillated fiercely over the last 2 months (early days in my grow out!) I am going to persevere though! I’m surprised at how excited I am to see it finally all going silver now that I made the commitment. Basically, I am surprised by the fact that although I hate it 99.9% of the time, I still stick to it. This is not really me. Sucking it up and waiting, but I’m doing both things, I’m learning something here. I’m barely into this but now that I’ve made the definite decision it’s exciting to see what I’ll look like. You don’t get that every day, that there’s going to be something new about how you look. I’ve been so surprised at how fun it feels! It’s incredibly powerful to push back against society’s idea of what makes a woman look beautiful. I feel like I’m paving the way for my daughter and other women to allow themselves to just be who they are, naturally. I moved overseas and was never happy with the way they dyed my hair here. So, after getting a great dye job and beautiful highlights last summer back in the US, I just knew I was done even trying over here. When I told some of my Tunisian colleagues that I was going to stop dyeing my hair, they actually gasped out loud. That is not done here! Anyway, 7 months in and I am getting the most crap from men who ask me incredulously if my husband likes it! Which he does. At my last trim, my male hairdresser would not stop begging me to color it. Politely and firmly, no. When I get back to the states for my one month vacay, I’m gonna get a long pixie and most of the dyed hair should be gone. Short hair is also not done here so yeah. I’m going to be a complete and total rebel. And I love it. I love the non-conformist element! I’m surprised how empowering this is! I was constantly hiding, fighting again ashamed or feeling inadequate when (the grays) showed… that’s such an impossible task. And then, from the minute I made the decision, I did not hide it in any way, not once. I even have a brand new bottle of root touch-up that has gone unused. There is no point for me to use it, as I’m not hiding anymore! Yes, it looks odd and uncomfortable sometimes, but strangely, I feel so much more confident by showing it all and “owning it” than I ever felt when my silvers were perfectly (or imperfectly, who am I kidding!) hidden. I never thought I would feel this confident about it. At first, I thought that I was the only one in the world who ever stopped dyeing their hair cold turkey. Then I found this amazing community of people doing pretty much the same thing and cheering each other on with messages of support, encouragement, and love. The pro is definitely having found this amazing community, where together with achievements, vulnerable moments are shared. And in the mostly fake world of curated pics that is such a relief. And I feel love and support when I’m not loving or supporting myself. And that doesn’t come in a box with a number on it. The support of the silver sisterhood is amazing. I am noticing more and more people who are transitioning to grey/silver and I’m loving their look so it gives me hope for mine. This amazing group of women all over Instagram leaving colored hair behind in their own ways is so inspiring! I started by sewing hair bands to hide my roots. Some days later I found the silver sisters on Instagram. I never wore those headbands. My biggest surprise is my husband. I was surprised by my husband telling me if I dyed it again he’d be mad! My husband loves that I am growing older and embracing the changes. I get hit on all the time! My husband does not like it and I’ve been feeling shame towards myself and my grey hair. 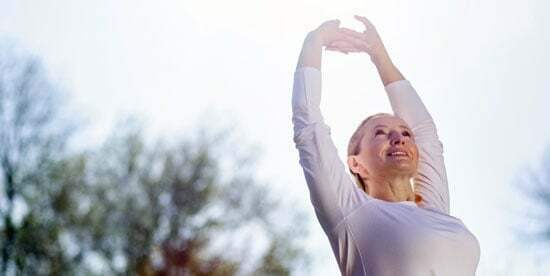 What surprised me was I started to seriously take charge of my health – physically, spiritually and emotionally. 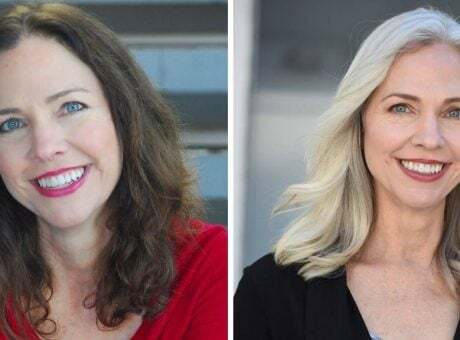 Setting healthy boundaries was life-changing, even more than going gray! I became committed to self-care. When I’m feeling good, I can be a better wife, mom, and friend. Confidence and a feeling of presence in myself and the world. I also KonMari’d my whole damn apartment and cleaned out some friend baggage. For me, it really really boosted my confidence in all aspects of life. Self-actualization! I got a more kickass attitude, because if I am able to have such self-control and confidence… I can do anything. The confidence and liberation you feel! I started loving my hair and myself again. People listen to my opinion more. For me, it was the speed at which this boosted my self-confidence in life and the unexpected amount of self-acceptance that came with it. The decision to stop dyeing my hair had a knock on effect on other things. For example, I also stopped plucking my eyebrows. It took a while to grow and I did wonder at times if people thought it looked weird but strangely I didn’t really care. I seem to have rediscovered my clothes as well. I got rid of some I didn’t really like and just appreciate the ones I do love more. I actually don’t have that many but it doesn’t seem to bother me. I do feel liberated on so many levels and I like the “new” me. I feel so confident and bold! I used to be terrified of anyone seeing my roots. Now I wonder what I was so afraid of. How much more self-confidence I have. No longer thinking about if someone is noticing my roots. No roots to notice! I thought I was just giving up the dye but in reality, I gave myself the gift of being the person God created me to be! I’m at peace with growing older. I feel my age, in a good way. I have always been taken for much younger. I know this is a benefit but I earned these years. I realized that many, many women start getting gray hair in their 20s . . and that we (meaning modern society) somehow INVENTED the idea that only old people have gray hair. I feel authentic and like I am a good role model for natural aging for other women. It’s a relief that I can accept how old I am and move on with it instead of feeling like I have to fight the clock. I sometimes still wonder, does it make me look older? The transition feels like a pregnancy. A very long one. While I dyed I wanted my hair to grow slowly. Now I’d like it to grow some inches over night. Hurry up, sparkles! My hair is growing too slowly…..I wish I was fully transitioned already! I love not having to dye my hair every 2-3 wks but the long period to grow it all out completely (2yrs?) is trying at times. I feel that they grow very slow! I want to see the final process!! And of course, the gray hair transition is also about hair, as well! My hair feels so much healthier and has stopped falling out! I’m only 5 months into the process and I’m really surprised that I have new growth and I’m losing fewer strands in the shower. My hair FEELS thicker! For years I thought I had thin hair. Come to find out it was just damaged from all the chemicals. Now I have thick healthy hair and I don’t have to spend tons of money on expensive conditioners! I have curls now!! Wash and flick! That’s it. My stylist was as shocked as I was. He says it’s from the grey hair being coarser. I had unmanageable waves before that just looked awkward. My hair feels so much better than the dried up frizzy mess that it used to be. My silvers are a bit less curly. I was kind of worried they’d be kinkier, since I’ve had a lot of natural curl since I was about 13. It’s like my whole head of hair is more smooth curl and more relaxed. I used to dye my hair every 4 weeks. I started getting a receding hairline and a lot of fall out. I’m 9 months in and have a lot of new growth, less fallout and my forehead has gotten smaller. The texture at my nape either needs tons of moisture worn wavy or blasted to smooth. The rest of my hair is silky. I’m amazed with the softness and texture of my natural hair! How soft my new growth is and how I sprouted all this surprising new growth. My hair is the same texture it was pre-dye – not coarse or wiry at all! My super straight hair turned curly. My hair has stopped falling out, when I thought I was losing it permanently. I am so surprised at how healthy my hair is now, and only 3 months after I stopped dyeing my hair. I battled frizzy hair and gray roots for years. I missed my pre-dyed hair texture terribly, but I honestly thought that the awful texture of my hair was because there was gray hair under the dye. I mistakenly thought that dyeing was somehow helping my hair look better, but it actually looked worse due to the dye! I am committed to this long journey and I’m excited to see what my true colors are! I examined the structure of my hair and was surprised how rough the dyed part is. I was never aware of the damage my hair already had. Surprised to find that even though we don’t colour anymore…it still needs a lot of attention and love to avoid discolouration. Lots of baby sparkles that behave like toddlers (doing what they want and don’t care what I want them to do). I’m not as white as I thought, but a really cool very dark bluish steel grey with white stripes.😍. Much darker than my dyed color. I’m surprised at what parts are growing in salt and pepper and what is almost white. Didn’t realize my natural hair color was so dark. I still have a lot of brunette- not all gray. I didn’t even know what my natural color actually was. I just love the silver color that’s coming in and my silver hair seems much healthier! Surprised that I’m not as silver grey as I thought at the back of my head. My hairdresser had me fooled!!! That I actually liked my white and silver hair. Also, I have a dark streak In front. A radical change from, “OMG, there they are again! I need dye on my roots STAT!” To, “There they are! I wish I had MORE! Wish I had more gray. I’m salt and pepper. I’m surprised by my love for the white in the front of my hair. It’s definitely not as all-over grey as I thought. I’m surprised at how many colors are in my natural hair! I have ‘slices’ of natural white hair from root to tip and although I have fully transitioned and all natural it is not all one colour, so it is as if I am still transitioning (if that makes sense). What has surprised me most about going gray is how crappy my dyed hair looked on me. What was I thinking? My biggest challenge, because my skin tone is warm, is that colours which suit my skin, don’t suit my hair eg. yellow now looks terrible on me. I think that grey hair works really well for women who have a cool undertone (those who look good in cool greys, purples, magenta and black etc) but for those with a warm undertone the cool hair colour is a challenge. I’m surprised by how many people stop me to comment on it. I get comments from silver sisters, women that wish they had the courage to be silver sisters, and even more surprising all kinds of young people, male and female. Surprised how much I love the silvers now and how soon my feelings changed from hatred to love. I had no idea what was lurking under my fake hair color! So glad to be rid of brassy blonde hair. I’m obsessed with looking at my new silver in different lights. It’s all so exciting. People literally stop me in the street to tell me how much they love my hair..
I’m pleasantly surprised by all the positive comments I’ve been getting! Bonus! Compliments from strangers are the best. My skin tone looks much clearer now and my eyes sparkle. I am surprised by how much I love it.. I get many more compliments on my hair as a silver than I ever did as a brunette. One of the best side effects is that I get compliments about my hair. I never did when I dyed it. I get stopped a lot just to be told how pretty my hair is and then it follows with an awesome conversation with really nice people. I’m surprised at how much I like it and surprised by how much earlier I decided to go natural. My plan was to wait until I retired but that’s 10 years or so away so I started not coloring earlier than I had planned. 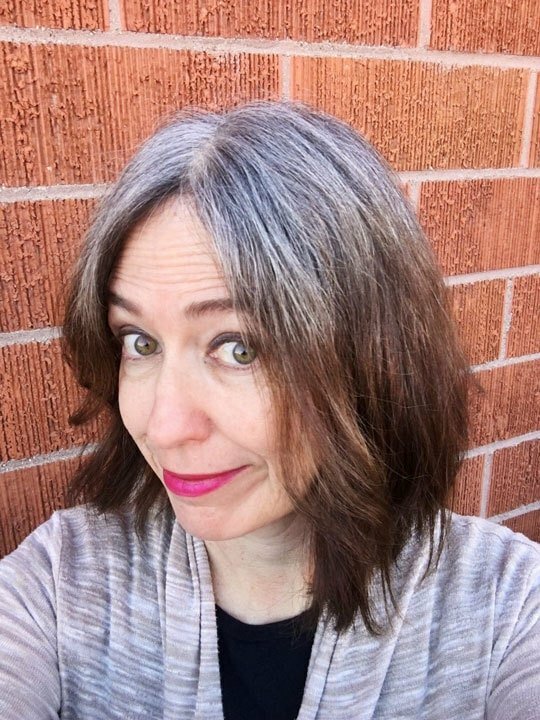 I used to tell my husband, “If I’m ever in the hospital for a while and can’t dye my hair please color it for me because I don’t want anyone to see me with gray hair.” That was then. Now I’m asking him every few days, “Is it coming in more now? I absolutely love my hair. Spent too much time and money dyeing my hair. It never looked right. The grey is very freeing and I get compliments on my hair all the time. I also have a great hair stylist that cuts my hair beautifully. I stopped coloring my hair 4 years ago. Not going back! Very surprised by how much I liked my sparkles! I bought a ton of headbands thinking I’d want to hide my skunk stripe, but instead, I just went with it and felt excited and obsessed with watching it grow! My teenager’s friends think her mom is hip for rocking the silver. My hair always looked too red or too blonde when I coloured it and I think now my colour suits me! Surprised how much I love the grays now and how quickly my feelings changed from hatred to love. OK, ladies – that is it for now! How about you? 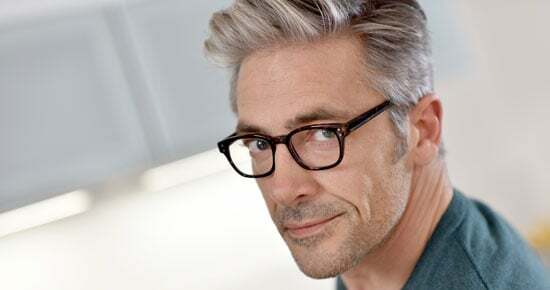 What has surprised you about the gray hair transition? I’d love to hear your thoughts in the comments! And check out my Gray Hair Before & After post if you get the chance. It’s fun to see everyone’s transformations! I stopped coloring my hair July 2014, cut off all the colored ends May 2015, two weeks prior to my daughter’s graduation. It took a few weeks for me to feel I’d done the right thing. Then my aunt (3 yrs older than me) told me I’d inspired her to go natural. My mom said she’d never do it….6 months later she was growing hers out! The three of us are fully transitioned and no two alike, my mom’s hair is much darker and my aunt’s is much whiter. We’re all beautiful! Each of us gets multitudes of compliments from all sorts of people. I’m so glad to be gray! That’s wonderful, Jennifer! It’s great that you inspired your family! I love gray hair – it’s so unique! Agreed! The idea of dyeing your hair for the rest of your life is daunting – I’m so glad to be done with that. Glad you are enjoying the blog! I became salt and pepper in my 30’s. My hair dresser encouraged me to color to highlight the grays, said it would look nice. It did but wasn’t my thing. Then as I got “older” around 59 I started coloring it a soft black to match the hair I was adding to get the two strand twist look. Now at 62.5 I decided no more coloring. Recently I’ve been guided to this group with pictures of sooooo many others rocking their gray. Their pictures have been inspiring!!! I’m tired of waiting for it to grow out and since my hair grows pretty fast I’m ready to rock a short fro until it grows out more. Thanks ladies for having the courage to rock your gray!!! Your hair sounds gorgeous, Desiree! I loved reading all these comments! I recently decided to stop using henna on my reddish brown hair. I knew there was some gray in there and I was afraid it wouldn’t suit my pale warm coloring. But I started to realize the orange highlights looked ridiculous and I was not really matching my original hair color. I’m too months from my last henna and this past weekend did a henna removal process. It got rid of the orange, mostly, and made my hair darker in places. It is interesting to see where the gray is going to come in. I may get a couple of big streaks, which I think is fantastic! Thanks so much for this blog and your YouTube videos, I am learning so much! Susan, I’m so glad that worked out so well for you! So glad you are enjoying the blog & videos!